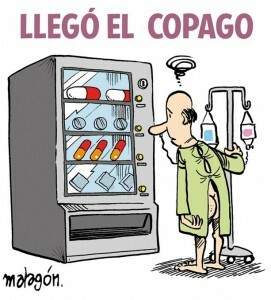 As from this month, all regions of Spain are supposed to charge non-admitted patients a proportion of the cost of the medicines dispensed to them at hospitals. So the idea is that if you go to A&E and get treated, but not admitted, on the way out you have to swipe the old credit card. But not if the prescription is for a cronical condition : 147 medicines for long term treatments are exempt. So expect to see a sudden surge of short term admissions to hospitals as doctors agree to save me ole mucker Juan a couple of quid, and get a free meal into the bargain. However, some common medicines for the side effects of cancer treatments aren’t included. Trouble is, the regions aren’t keen on this unpopular measure. In fact, the only regions who will be doing this are the cities of Ceuta and Melilla, while Galicia, Madrid, Castilla-La Mancha, Cantabria, Murcia & La Rioja all say they’ll -reluctantly- implement this new legislation during this month. The thing is rapidly descending into another good old Spanish Madrid against the regions farce. The legislation was supposed to have been enacted last October, but was delayed for “technical reasons”. Now all the regions are again asking for a further delay, arguing that they haven’t had time to implement the new systems. And the left-wing political parties are making gains, slowing the whole process down. It’s one of those measures that seems easy to implement, but due to the way that the health system is devolved to the regions, can only be done if all the regions of Spain agree. But other regions such as Canarias, Andalucía, Aragón, País Vasco, Cataluña, Comunidad Valenciana, Extremadura, Castilla y León & Baleares have all announced they will not implement the system, for either technical or political reasons. Andalucia has gone further, by lodging a complaint in the courts against the new law. The amount to be charged to the user is supposed to be 10% of the retail price of the medicine, up to a maximum of €4.26 per medicine. This entry was posted in Blog and tagged charges, copago, health service, healthcare, medicine by David. Bookmark the permalink.